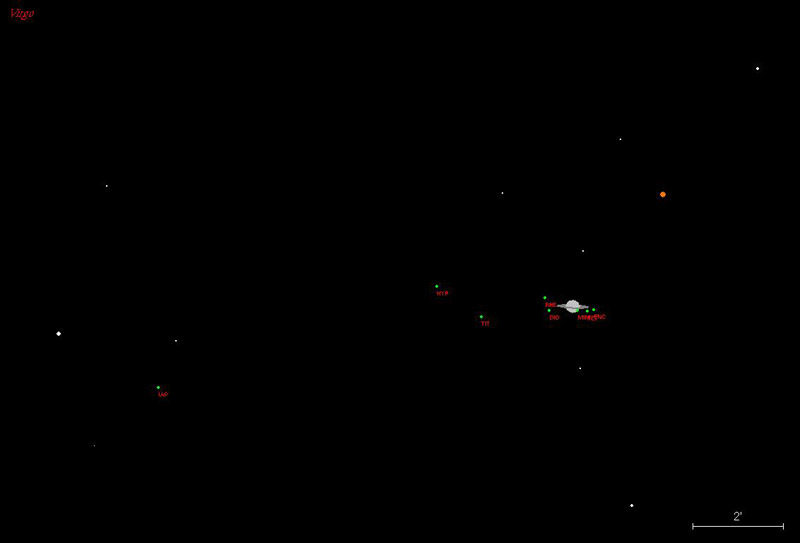 This graphic shows the bright and dark features on Iapetus, and was derived from Voyager data. Remember that Iapetus is tidally locked with Saturn, so as Iapetus orbits, the same side is always facing Saturn. Saturn's third largest moon Iapetus is a bright magnitude 10.1 at western elongation and a faint 11.9 magnitude at eastern elongation. 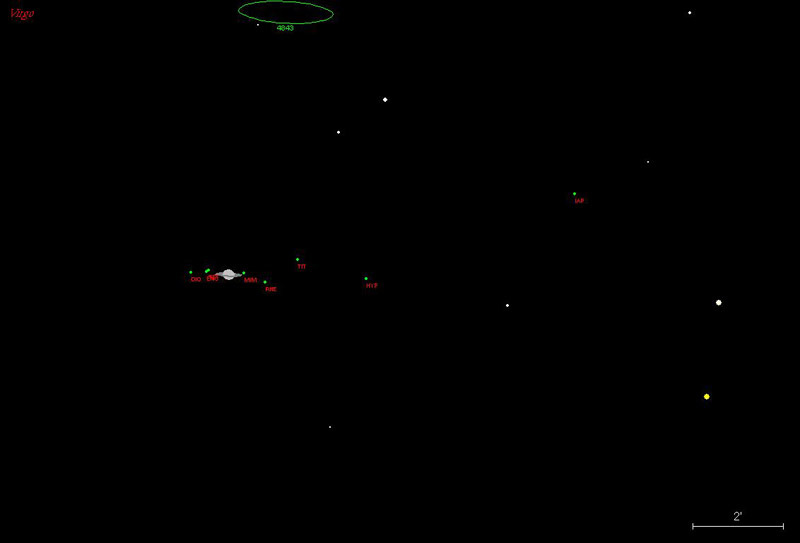 This makes Iapetus a challenging but fun observing project when the Saturn system is in our evening skies. 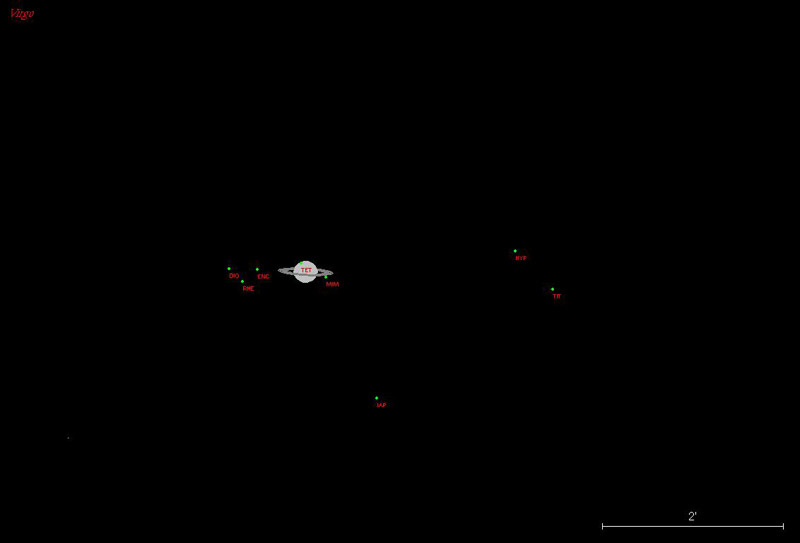 Its 79 day orbit takes Iapetus far outside the usual planetary eyepiece view. Iapetus is 3 times further from Saturn than Titan, or 12 ring diameters from Saturn when it shines the brightest. 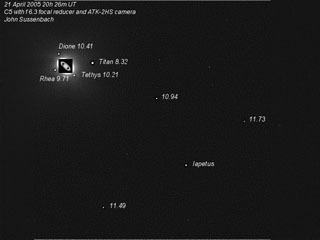 Iapetus is easier to locate near Saturn at both inferior and superior conjunction, when it is closest to the planet and visible to the north and south of the planet, respectively. Half of Iapetus appears as dark as asphalt, the other half, as bright as snow. 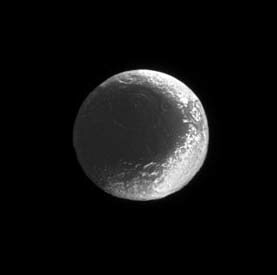 The dark half faces forward as Iapetus moves in its nearly circular, inclined orbit around Saturn. Scientists generally believe that it has swept up the orbiting dark material (perhaps originally from Phoebe) that covers its forward-facing surface. 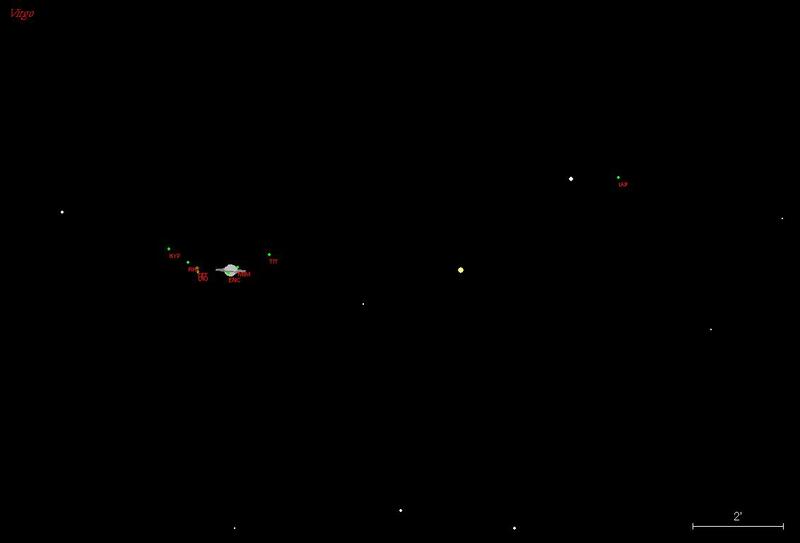 Iapetus' light side is more than five times brighter than its dark side. 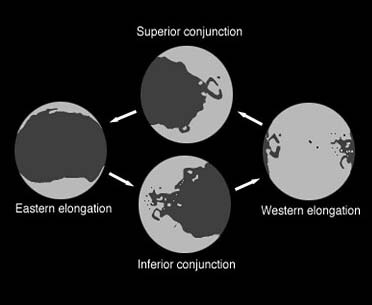 We are looking at the light trailing side of tidally locked Iapetus when it is at western elongation, and we are looking at the dark leading or forward side of the moon at eastern elongation. When Cassini discovered Iapetus in 1671 he noted that he could only see Iapetus on one side of Saturn and not on the other side. On January 1, 2005, Cassini flew by Iapetus at a distance of 76,000 miles or 123,000 kilometers. The next Iapetus flyby was on September 10, 2007 when Cassini flew by Iapetus from distance of only 763 miles or 1,227 kilometers. 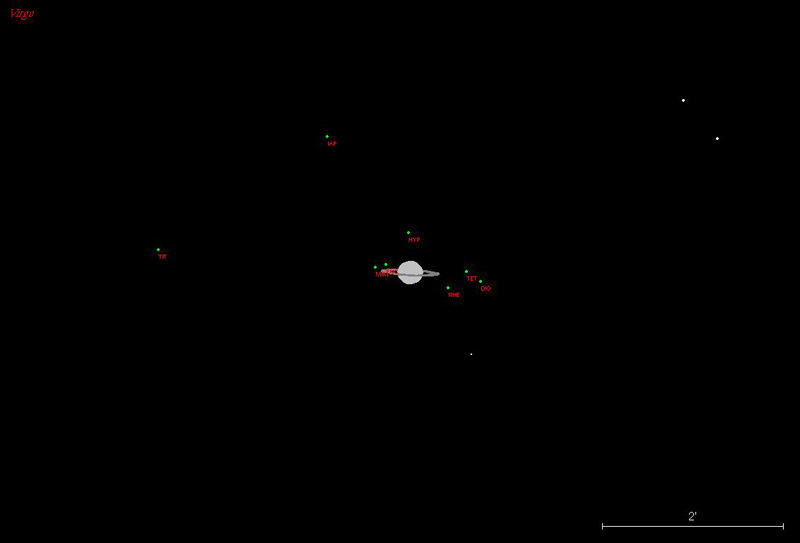 To find Iapetus at either conjunction or elongation, and compare its brightness to nearby stars, use your favorite planetarium program to calculate the extreme magnitudes of Iapetus, and to compare it to nearby stellar magnitudes. 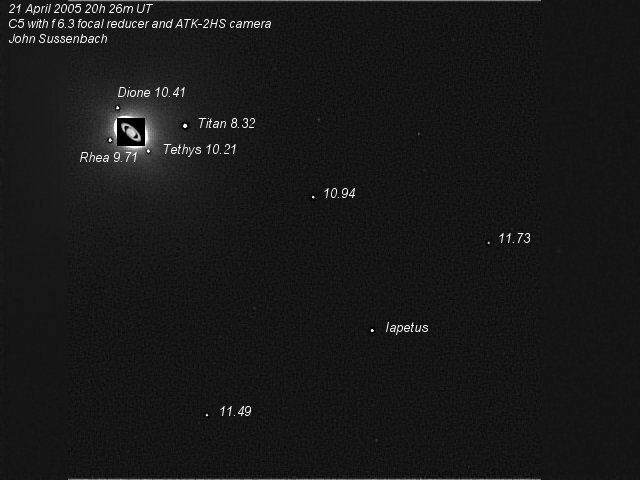 Some key Iapetus observing dates from the 2011 RASC Observer's Handbook, page 246. The highlighted dates link to finder charts from SkyMap Pro. South is up in these charts to match many telescopic views. Make your own charts for your precise location and observing time. 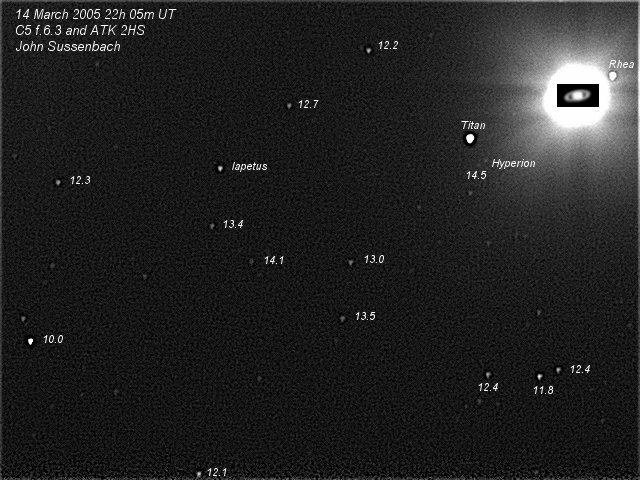 This photo was taken on March 14, 2005, close to eastern elongation, by John Sussenbach with a 5-inch reflector telescope, showing several comparison stars in the vicinity of Iapetus. Click the photo for a 640x480 image, or visit his website. John took this image on April 21, close to western elongation. This photo used a shorter exposure time than the March 14 picture. 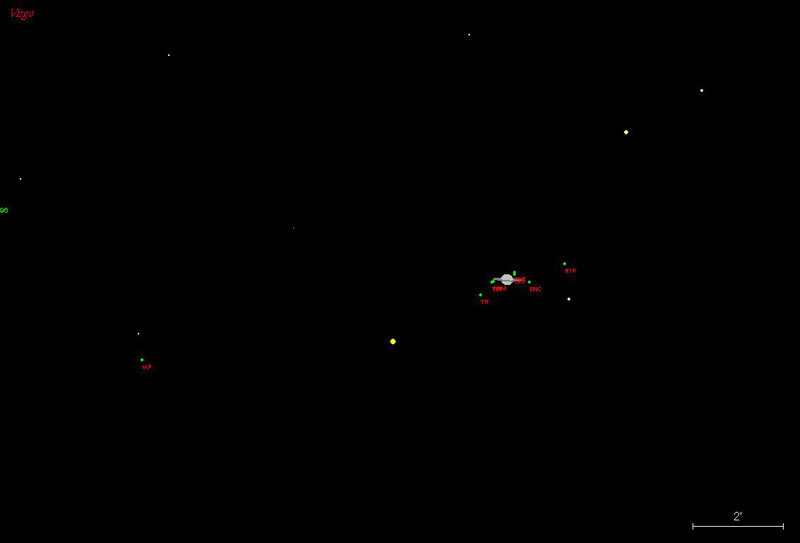 Note the brightness difference of Iapetus as compared to Rhea. Click the photo for a 640x480 image.